The Bon Secours Hospital in Dublin has begun a pilot study of 50 patients of the latest version of the pill camera. The vitamin-sized capsule has more wireless cameras built into it, to detect small bowel and colon diseases. 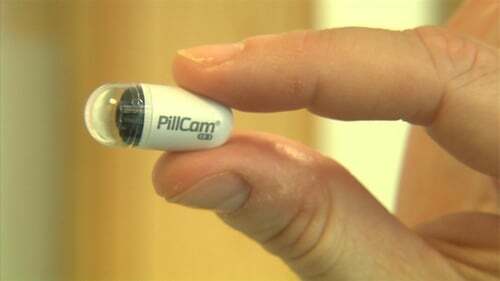 The new version of the pill camera is being pilot-tested on patients at the hospital to examine the small intestine. It is smaller than previous versions, has more cameras built in and can see 360 degrees. Traditional colonoscopy cannot see into the small bowel and other than using X-rays or other specialised procedures, the pill camera allows precise examination. The wireless camera has flashing light and takes about two pictures per second over eight hours of the test - over 55,000 pictures. The images are sent to a data recorder worn on a waist belt. Specialists download and view the footage afterwards. The pill camera is disposable so it should pass out of the body naturally and there is no need to retrieve it. The service has been launched in conjunction with a Direct Access Endoscopy Programme at the Bon Secours, whereby GPs can refer suitable patients directly to the private hospital for a scope. This system bypasses traditional referrals which involve an initial outpatient consultation in advance. Under the service, a GP can refer a patient directly to the endoscopy department without necessarily having to see the consultant beforehand. Patients can have a procedure completed within 72 hours of referral by the GP. The hospital believes it could help reduce public hospital waiting lists for endoscopy.